Region: This bug is found in eastern North America and do their worst in the Mississippi, Ohio, and Missouri river valleys, in Texas and Oklahoma, and in far southwestern Ontario. Life cycle: This insect produces two to three generations each year and the adults hibernate in clumps of grass. Physical Description: This tiny, 1/16 inch long bug is black with white wings, red or brown legs, and brown antennae. It emits an offensive odor when crushed. The nymph is red with a white stripe across the back or black with white spots. The dark red or white, curved eggs are laid in the soil or on roots. 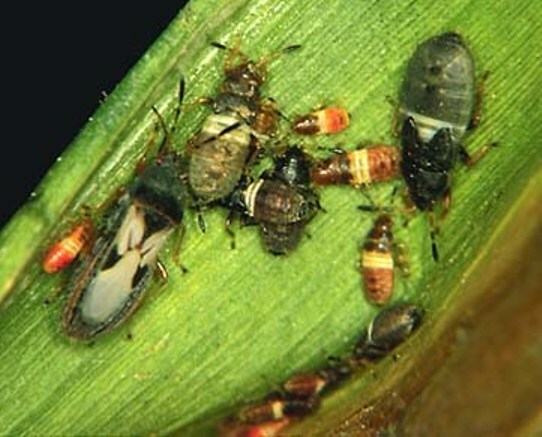 Feeding characteristics: This pest attacks corn by feeding on the leaves and stalks, sucking juices. Both the Adult and nymph do damage. Controls: Keep the garden area free of weeds. Fertilize the soil and plant early. Small grains are also appealing to this pest, so do not grow wheat next to corn. You can interplant soybeans to protect corn by shading the base of the corn stalk, making the stalks less attractive to this insect. There are several resistant varieties available. For serious infestations dust with sabadilla.